Through our fossil collection, we continually learn more about the past. Each new find contributes clues that can be used by these fossil detectives. By taking care and following these guidelines, you can help our scientists solve mysteries and unearth stories from long ago worlds. We appreciate your cooperation in helping decipher the past life of Anza-Borrego Desert State Park. This may be difficult, but it’s very important. A fossil can tell stories about the time and place it comes from. These stories are sometimes complex and once the fossil is moved, part of the story is lost forever. If you find a fossil, place a small pile of rocks nearby, or somehow mark its location so it can be found again. Jot down information about the specific location. What wash is it in? What is the nearest cross-road or wash? What other landmarks are around? How many miles is it to the nearest highway? If you have a park map, mark the location as best you can. Next, call or stop by the Visitor Center to let park staff know about your find. Give them all of the information you’ve gathered. The Visitor Center staff will contact the park’s paleontologists who will return to the site as soon as possible. If you are staying in the park, the paleontology staff may ask you to return to the site with them. The first thing the park’s paleontological crew will do is observe, measure and photograph the fossil. Next we will determine the exact location of the object, using topographic maps and aerial photographs. We also use the Global Positioning System for precise location details. Later, we’ll search the immediate area for more fossil remains. Once the initial examination is complete, a detailed geologic study is made. We want to know what time period the sediment belongs to. How does it relate to other fossils we’ve found.? How does the fossil bed run, in what way is it tilting from the horizontal? How thick is the bed and how thick are the fossil beds above and below it? What color are the sediments? What is the sediment made of, pebbles, sand grains, silt, clay? We also check the compass orientation of the bone. All of these observations will help us to reconstruct the animal’s habitat and lead to an understanding of the animal’s world and it’s lifestyle. Only once all of these data have been recorded, a professional crew will excavate your fossil find. Care will be taken to remove it exactly as it lays. Volunteers at the Stout Research Center will clean and repair the specimen. Next it will be identified and catalogued Your name will be recorded as the finder of the fossil. Eventually it will become part of the park’s collection along with over 15,000 other fossils. For example, Anza-Borrego Desert State Park has one of the most complete mammoth skeletons ever unearthed. We know a lot about its life because it was left in place until the park’s paleontologists could examine it. 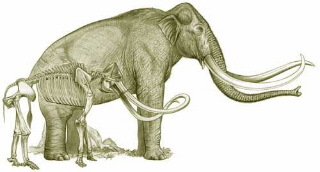 The mammoth is a female. She was found with her right side down, headed upstream in a distal alluvial fan. She was 60 years old and had arthritis in her jaw. She must have had some difficulty eating, and she definitely did most of her chewing on the right side of her mouth. Paleomagnetic dating tells us her bones are from 1.1 million years ago. Another interesting fact we learned is that during her day, that stream she was found in flowed from northeast to southwest. Today, that same stream runs west to east. If park visitors had removed parts of this fossil before experts could view her, important parts of her story would be missing.